Location: Jik family hotel is situated 300 m from the Gondola ski lift in Bansko ski resort and at 15 minutes walking distance from the centre of the resort. The hotel offers shuttle-bus to the gondola lift. Accommodation: The hotel offers 10 double rooms with two single beds, folding sofa, view to the mountain, heating, TV with satellite channels, mini bar, balcony, Wi-Fi internet, working desk, electric kettle. 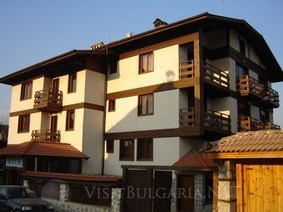 Bars and restaurants: The hotel offers lobby bar and tavern (mehana) in a traditional Bansko style and cuisine. Spa centre: At guests disposal are steam bath, sauna and jacuzzi. Facilities: Safe at the reception (free of charge), Internet access - Wi-Fi, Internet corner, credit cards, parking and shuttle-bus to the gondola lift.